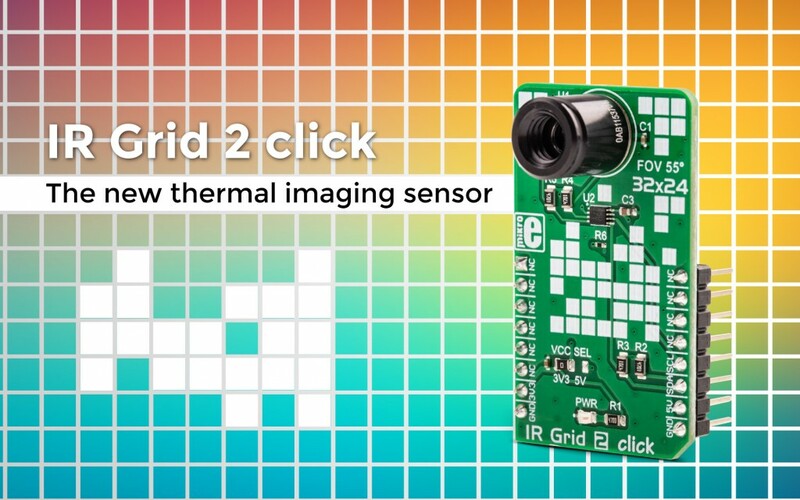 HomeBlogClick boardsWe’ve made a new thermal imaging sensor – IR Grid 2 click. We’ve made a new thermal imaging sensor – IR Grid 2 click. With an array of 768 very sensitive, factory-calibrated pixels, arranged in 32 x 24 rows, the IR Grid 2 is capable of measuring an object temperature up to 300˚C within its Field of View. IR Grid 2 uses the IR sensor (MLX90640) with 4 pins only, mounted within the industry standard, TO39 package. The sensor is an ideal solution for building a range of thermal detection applications. If you need to build a thermal scanner, precise contactless thermal measurement, to detect human presence, or to locate a thermal leak in your home, the IR Grid 2 click will suit your needs perfectly. Compared to its predecessor, IR Grid click, the IR Grid 2 is offering a more precise image due to having more pixels. It also has a wider Field of View (110˚x 75˚), allowing an instant view of the entire object temperature through the pixels.